In a world where we are increasingly social and inter-connected, the concept of social proof in marketing has been talked about more and more. As a concept, social proof is one we all probably recognise. In short, it’s the phenomenon centered around the fact that individuals often do the things they see other individuals doing. Why does social proof marketing work? To some extent because we want to fit in (i.e. peer pressure), but in addition to this – particularly where purchasing decisions come in to play – we often believe that others are better informed about a specific market area than we are, and thus we ‘follow’ the crowd. You’ll have seen social proof in action many times – if you’ve ever been out clubbing and seen the nightclub queue which is very long, and instantly assumed that the place is the best club in the world. In fact, bouncers and doormen are often told to let people in slowly to increase this perception. In coffee shops and cafes, staff quite often put a few example coins or notes in to the tip jar to give the impression that previous customers have been good tippers. Even McDonalds, with the line ‘Billions and Billions Served’ on their signage, is getting in on the social proof act. 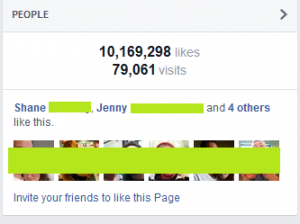 So, how can you use social proof for small business? One of the best methods for utilising social proof – if you offer a good product or service – is to allow previous purchasers to post reviews, or ask clients to provide testimonials about your service. Statistics from 2013 show that 85% of consumers read online reviews for local businesses, with 73% saying that positive online reviews will make them trust that business more. Another potentially powerful way in which to use social proof in marketing is to combine it with the Halo Effect – a topic we’ve covered before on the Rippleout Blog. In short, if you can get a celebrity, or industry expert for instance, to back your product or service – even through a tweet or blog post – all the positive associations connected to that celebrity or expert will be reflected in your product to some degree. We tend to judge (and like or dislike people) in a very universal way, and so if we think a famous comedian is funny and likeable, we’re fairly likely to be warmer to the company he bought a kettle from – despite the fact he may know nothing about energy efficiency, design or electronics. Finally, social media has also allowed businesses to utilise the social proof of friends. Facebook, for instance, will tell me if one of my friends likes a major takeaway brand – and if Jake likes it, and I like Jake, it seems reasonable (not rational) that I may well like the food delivered by this brand. Generally, we tend to like things and people which we deem are ‘like us’ in some way – the majority of humans are pretty egotistical. For instance, research suggests that we tend to give more weight to the opinions of people we perceive to be most like ourselves, we tend to be friends with people who hold similar views, and we buy things that represent us in some way (I myself have just purchased a large collection of George Clooney DVDs). Anyway, to return to reality, and the point, this is why Facebook will tell you what your friends like, and encourage you to invite others – remember, they feel the same way (subconsciously) about you as you do them!